Roger Federer won the Paris Masters for the first time on Sunday by defeating Frenchman Jo-Wilfried Tsonga 6-1, 7-6 (7/3) in a one sided final. It was the Swiss star’s third tournament win of the year after Doha early in the year and his Basel hometown event last week. 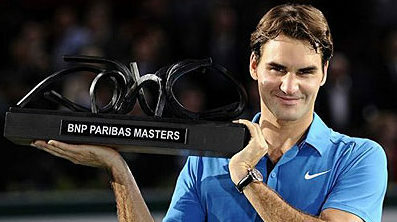 It was also his 18th Masters title win, second only to Rafael Nadal who has won 19 times. Tsonga, the winner here in 2008 and a hugely popular figure with the noisy Bercy Stadium crowd, was aggressive from the start and he immediately had two break points. The 30-year-old Federer, though, saved them both and then totally took command of the match running off five games in a row with two breaks of serve. The Frenchman finally got off the mark by holding serve at the third attempt, but Federer was easy on serve and he promptly pocketed the first set. Tsonga looked shell-shocked and frustrated, but he held serve twice to take a 2-1 lead at the start of the second set and finally profited from some errors from the Swiss star to put some pressure on his opponent’s serve. A whipped crosscourt forehand which wrong-footed Federer at the net gave Tsonga break point but he went for broke on his service return with a forehand drive down the line and missed by inches. Federer duly held serve again to level at 2-2 but he was in trouble again in the eighth game only for what looked initially like a Tsonga winner on the baseline to be called out much to the anger of the crowd. Both players held serve from there taking the final into a tie-break which Federer dominated from the start by powering into a 4-0 lead. The win makes Federer just the second player after Andre Agassi to win both the French Open at Roland Garros, which he took in 2009, and the Paris Bercy title. It sets him up for the ATP Tour finals which take place in London from November 22. Federer won this tournament last year.